These vehicles, which resemble enclosed, sturdier golf carts, will provide another transportation option for students and faculty, with more flexibility in pickup times and locations. “GOTCHA rides were designed to be transportation the way college students want to get around campus, and every school is a little different…but we find that there’s a large group of students who want transportation more on demand and they want to… make stops along the way”, said Sean Flood, CEO of GOTCHA Rides. Tech will be home to five GOTCHA Rides for now, with the potential to increase those numbers according to the use and popularity of the initial vehicles. “I think it‘s a neat idea, and hopefully students…and faculty will pick up on it”, said David Williamson, Tech’s Associate Director of Transportation. 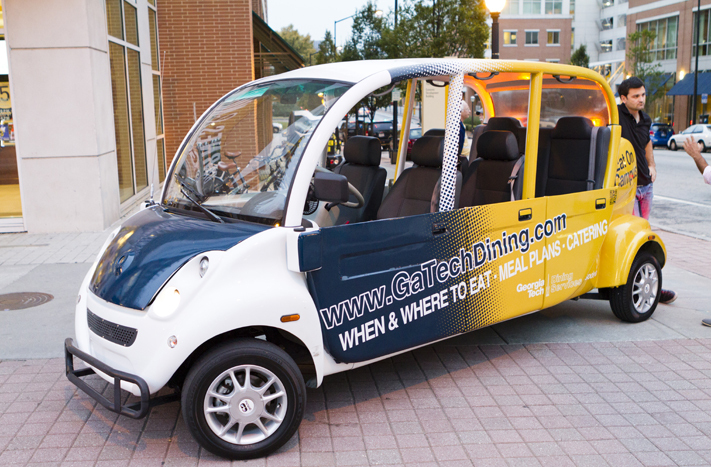 A unique feature of the GOTCHA Rides is that they will be completely wrapped in paid advertisements, costing about $3000 per month, for restaurants and campus facilities. The vehicles will also be driven by students, who are at least 21 years old and pass Flood’s thorough background check. A main goal of the GOTCHA rides is to provide safe and quick transportation, even more so than options like the Stingerette and Midnight Rambler, for students on late nights and weekends. “[GOTCHA has] another element in the evening to help move folks around”, Williamson said. For Flood, this will be the fifth campus he will put vehicles on. Other campuses include Florida State, University of Florida, and Auburn. Tech will be the companies first urban campus, which comes with a new set of opportunities and challenges. “I think it has to most potential to be successful, because it’s out first urban location. There’s a lot of areas we can go to and a really dense area of students,” Flood said. GOTCHA is also looking to add rides to Georgia State and Emory, with the potential to create an intercollegiate network of GOTCHA Rides.